PLEASE REGISTER AND BE COUNTED. SPEAK OUT AND BE HEARD. LET IT BE KNOWN THAT WE ARE PART OF THE SCHOOL. BUMALA KAYO! MEN PARIKNA KAYO! ADI KAYO EN LUMLUMNEK AY KAMAN DIN ESKWELAAN!!! THIS IS OUR OPPORTUNITY TO UNITE. JUST FOR ONE CAUSE. JUST FOR ONE. That all will know and hear"
and I am actually so happy to know someone like you..
Mankayan High my Alma Mater dear"
haha great! we've got someone to vocalize our thoughts! take the lead, dyords!08) It would b more convincing if u make a breif introduction of yourself.. maid pa abe di picture mo yan..adi mi ammu nu cnu ka..
P.S. juz wondering, what ws d PM all about..
awni pay lang intro. natutungo sa. ta sumaak od. Kulang pa ng isang section. Through life's long and winding road. With loyal hearts we stand. 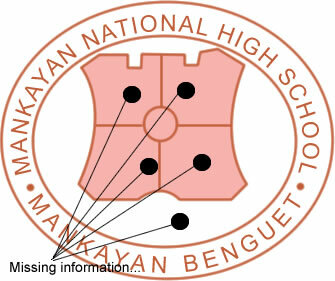 Mankayan High My Alma Mater Dear. Untill next time again... All lurkers. guests--- MAGREGISTER KA NA!!! Reminder: There will be a SITE VISIT at the High School on July 8, 2009 Wednesday. If you are at the vicinity of Mankayan please attend. All ALUMNI are invited. There will be an entrance fee... joke. Mind you it is becoming a tourist destination. yeah, i was informed ado kano bisita mankayan ngamin tourist spot en kano school tayo. ala bisita en the ti trahedya han nga pintas ti mankayan. really..? sad to hear that.. and it's not funny anymore.. .. buti nman sna kung concerned cla pra magset n lng ng donation box s schooL. atleast adda pakinabang.. tsk..
-that would be a good news. atleast ada ti makitan nga move para jay tragedy nga nangyari ti school, atleast a site visit would assess no anya dapat ti ikakasta...hope tuluy tuloy na. -hmmmm, so sad to hear na naging tourist destination,sabagay it's a common thing kanya tayo amin, tapno lang maging updated pero i do hope nga the main purpose why visit the school is not just makiusyuso pero to ring a bell nga something has to be done. many thanks met gayam ken m'msabit for getting us updated jay meetings and the likes nga mangmangyari ti school and the locality itself. kaneg et nantabotabun da pay..
hahaha.. ang hirap magtype sa kankanaey..
hmm more likely pati ung reading niya..
We have 47 registered already. Just keep coming guys. Inform the other alumni. The more we can get everybody to join, we can create a wave of awareness. This would be beneficial on coming up of a proposal to push the government or responsible group to escalate whatever is best for the school. We will show to them that we are here and concern to our school situation. Just by showing up you will be counted. Our Mankayan Team Base Alumni will be outlining our short and long term goals and from there we can have a concrete plan on what will be our contributions to help on the plan. It will be a ball park figure but the sooner we can get into the situation and the sooner we can have everyone involve, WE can make a DIFFERENCE!!! brief intro nman jan toks! Samahan mo nman ako d2! kala ta met han nga agkabatch nga!!! hmm..help me out here, admin..
i think this friend of mine is a li'l bit shy..